Hello and welcome to Curry in a Hurry, your curry and gambling partners, with fast food delivery and big jackpot prizes! Click here to play! You pressed 2. 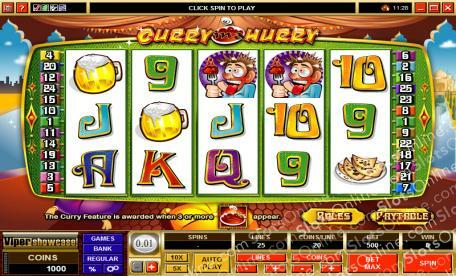 Our gambling options include the Curry in a Hurry video slots that feature curries, pints of lager, one of our happy customers enjoying our Thousand Spice Special, and the Curry bonus game. With 5 reels and 25 paylines, our customers report having lots of fun on the Curry in a Hurry slots. If you would like to try our Thousand Spice Special and try your hand at winning the Curry in a Hurry slots jackpot, please go to a participating online casino now. Your fun and enjoyment will arrive shortly after. Thank you for choosing Curry in a Hurry! The Curry symbol is the scatter symbol, which pays out on the total bet when 2 or more symbols are scattered across the reels. 2 symbols pay the same amount as the total bet, 3 symbols pay 5 times the total bet, 4 symbols pay 20 times the total bet, and 5 scatter symbols pay 100 times the total bet. The Waiter symbol is the substitute, substituting for all symbols other than the scatter symbol. The Curry Bonus is triggered when 3 or more Curry symbols are scattered across the reels. In this game, the player chooses 3 out of 5 curries, trying to find the hottest curry. The hotter the curries chosen, the bigger the bonus prize that is awarded.